One of the most painful injuries in all of sports is a broken bone. A tibia fracture (fracture of the shin bone) is one of the worst examples. Typically, a tibia fracture occurs with high velocity injuries, such as motor vehicle accidents, and is fairly uncommon in sports. You can suffer one playing contact and collision sports, such as football, rugby and soccer. The injury usually involves some sort of direct contact. Usually the athlete’s foot is planted on the ground when another force is directed on the tibia. For example, the athlete is hit on the front of the leg with the foot planted on the ground. Or the athlete could land from a jump with the foot hitting the ground awkwardly, putting too much stress on the tibia. Famous examples of these injuries include Joe Theismann being sacked by Lawrence Taylor and Alabama’s former wide receiver, Tyrone Prothro, landing badly while catching the ball. Fortunately these injuries are rare. The presence of athletic trainers at sporting events where these injuries occur is invaluable. Athletic trainers and physicians, if they are available on site, can splint the injuries and help to assist paramedics in the transport of these athletes to the emergency room. 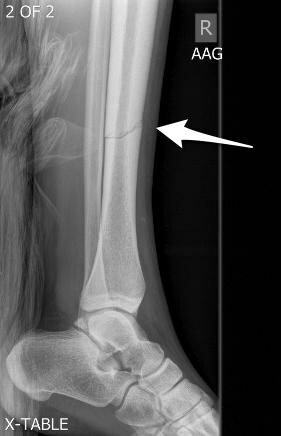 Note the fracture line of the tibia (white arrow). Tibia fractures are urgent, if not emergent, injuries. The leg should be splinted immediately, and the athlete should be taken to the emergency room for evaluation. If x-rays show that the fracture is nondisplaced, then it’s possible for this injury to be treated in a cast or walking boot. 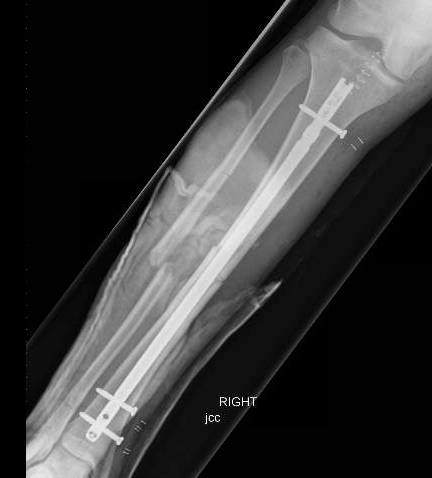 Most of the time, however, the injury requires surgical stabilization, often with a metal rod inside the bone. The nail inside the bone allows the patient to put weight on it almost right away. There are several complications of this injury that could make them potential emergencies. If the bone is poking through the skin, which we call an open fracture, then surgery to wash out the fracture before stabilizing it is needed to minimize the chance of later infection. Injuries to the nerves and blood vessels of the leg can also occur due to the high impact nature of this injury. Finally, a complication known as compartment syndrome can occur. Compartment syndrome occurs when the leg swells too much due to bleeding from the bone into the muscle compartments of the leg. There is only so much room for the muscles to swell before there is too much pressure on the nerves and blood vessels. This is a surgical emergency, and it can occur before surgery or even after surgery. An athlete on one of the teams we take care of recently had compartment syndrome after a tibia fracture. The surgeon had to do a fasciotomy, which is a procedure where the tissue that surrounds the muscle compartments is released. The athlete required several more surgeries after placement of the nail to try to close the skin from the fasciotomy incisions after the swelling had subsided. Return to sports after a tibia fracture is variable, but it usually takes many months. The surgeon has to determine when the fracture has healed enough to allow the patient to bear weight. Once weight bearing is started, the athlete will then go through extensive rehabilitation to rebuild the strength and restore full weightbearing with walking before activities such as jogging can be resumed. At that point, sport-specific exercises can be instituted. If the athlete’s fracture has healed, as determined by x-rays, and he or she has regained full strength, range of motion, and the ability to perform sport-specific activities, then the surgeon will likely allow the athlete to slowly return to sports.